COLUMBUS, Ohio -- Iowa kept up the Big Ten's blitz through its first six games in the NCAA Tournament. 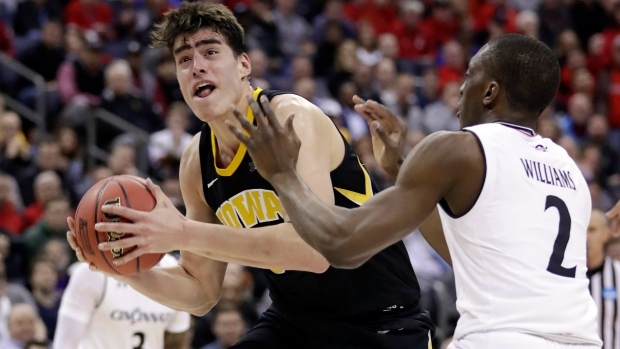 Luka Garza scored 20 points, Jordan Bohannon made a three-point play during the Hawkeyes' closing surge, and the No. 10 seed in the South Region kept its league unblemished by rallying for a 79-72 victory over No. 7 seed Cincinnati on Friday. "We've been saying all year long that it's the most competitive league in the country, top-to-bottom," Iowa coach Fran McCaffery said. "And you sort of expect Big Ten coaches to make those kinds of statements, but the reality is we actually believe it. "And so I think it's proving it." Cincinnati (28-7) won the American Athletic's tournament and had the league's player of the year in Jarron Cumberland. The Bearcats also had what amounted to a home-court advantage, with Nationwide Arena packed with fans that made the two-hour drive up Interstate 71. "It's tough," said Cincinnati point guard Justin Jenifer, who had a career-high 19 points. "I didn't picture that we were going to lose this game today." "That shows how powerful and strong this conference was," Bohannon said. The Hawkeyes went to a zone defense that changed the pace, and Joe Wieskamp had a driving layup and a 3-pointer that helped the Hawkeyes close to 36-31 at the half. Bohannon's long 3 -- his only basket beyond the arc -- gave Iowa a lead early in the second half, but Cumberland matched with his first 3-pointer to put Cincinnati ahead, setting a back-and-forth pace. The Bearcats hadn't played in Columbus since 1924. Their football team and men's basketball team are scheduled to play the Buckeyes in Columbus next season, the first time that's happened since 1912. Cincinnati football coach Luke Fickell -- a former Buckeyes coordinator -- was cheered loudly when shown on the video board during a timeout.